November is a great time to talk about FOOD…which just so happens to be one of my favorite things. I created this little activity to open conversation about Thanksgiving dinner foods and family traditions with my kiddos, so you can keep it as traditional or creative as you want. If you’re going the traditional route, you might want to make some food item picture cards like mine to help structure the activity. But if you’d like your clients to come up with their own favorite foods, give them a blank square and have them draw the item and share it with the group! Choose a client to drum/play their food word a few times, then get everyone in the group playing it. Each time you add a new food item, see how many words you can sequence together! It can get really silly if you’ve got a big group, especially if you’ve got creative food choices (ie CANDY, CANDY, CANDY). 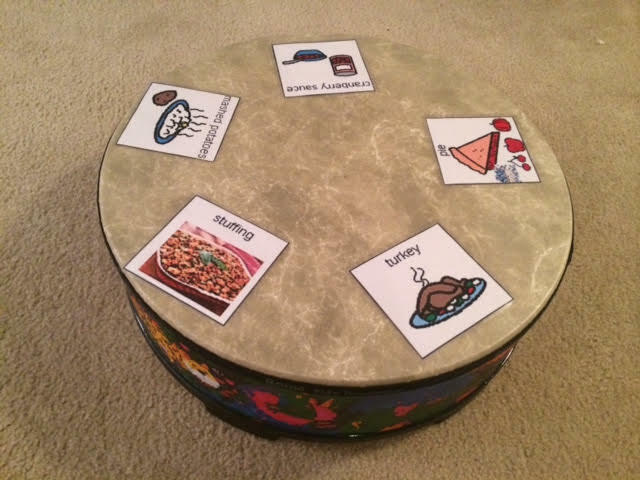 Sometimes, we even pretend the gathering drum is a table and practice asking for different food items (“Can you pass the turkey?” “Yes, I can!”) and pass the cards to a steady beat. November = TURKEY TIME!!! 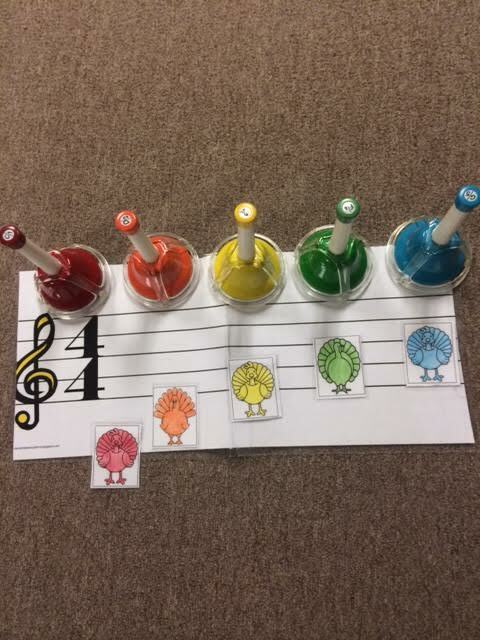 I like using turkeys as a session theme because they’re cute, can be used in endless ways and are great for speech goals (can I get a gobble, gobble?). Below are some of my favorite turkey-themed activities to use this time of year. 1. 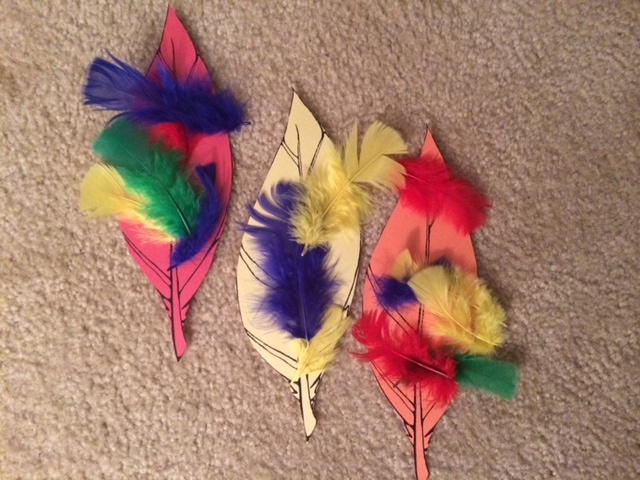 Feather Decorating: This is a nice art and music activity I like for self-expression and tactile experiences. We listen to Copland’s “Hoedown” and decorate turkey feathers with different sensory materials like feathers and stickers. 2. Turkey Drumming: This is a simple drum activity that I love for attention, impulse control, following directions, and speech goals. 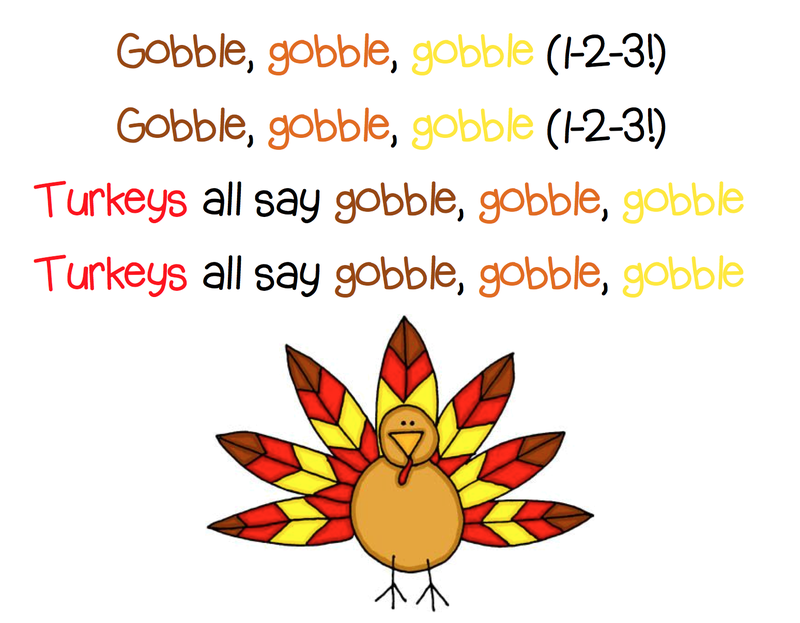 I sing it to the tune of “Turkey in the Straw”, but simplified the words so my kids could really focus on just saying “turkey” and “gobble”. I usually line up three tall drums and have kids strike each drum in order on the “1-2-3” beat that follows each line. With groups, I will give everyone their own drum and either choose a soloist to come play the big drums or ask for volunteers to sing the gobbles into the microphone. 3. Pass the Turkey: My most heavily used visual during turkey season is my turkey beanie baby! He’s the perfect size for passing around a circle or even for perching on a drum or piano during sessions. The kids love him! 5. Starvin’ Marvin: He’s basically a celebrity to my kiddos. Everyone wants to meet Marvin, is always very concerned about how hungry he is (When I pulled him out the other day, one kiddo said “Miss Kerry!!!!!! He’s REALLY hungry—he looks a little faint.”) and loves “feeding” him by tossing bean bags in his mouth. No time to learn the song? This also works great with “Let’s Turkey Trot” by Little Eva. 6. 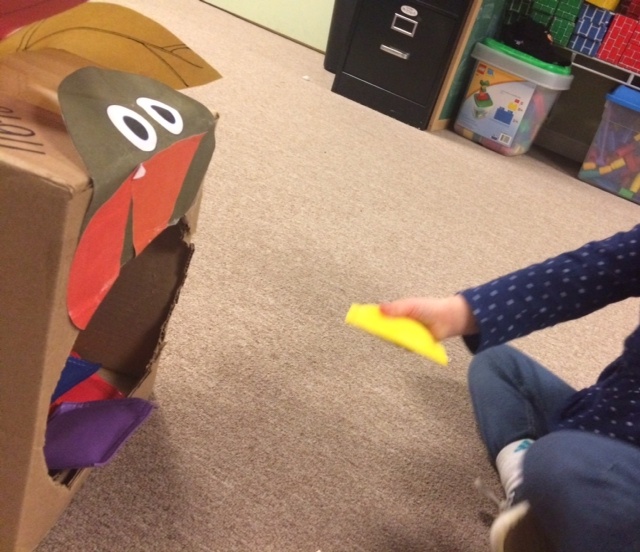 Rachel Rambach’s “Turkey Dinner Dance”: This one is always a hit and is a great way to work on gross motor movement. Plus, it’s pretty darn catchy! 7. Turkey Dance Party: Straw hats optional! Check out some of my favorite hoe-down dance songs below that will get your clients do-si-do-ing. 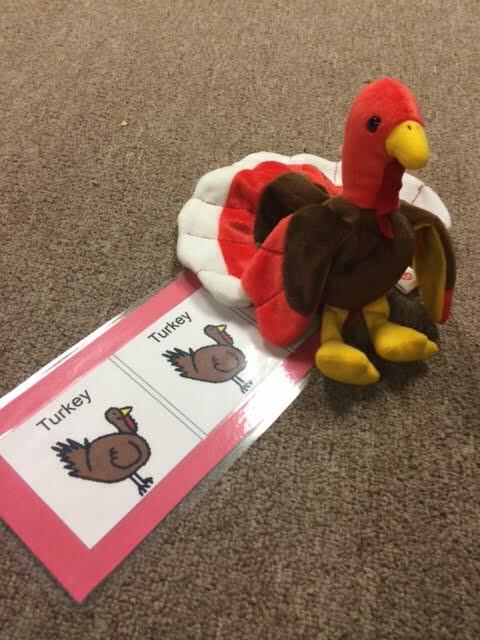 For this activity, your clients can practice impulse control, counting, following directions, turn taking and motor skills as they listen to the song lyrics and toss beanbags into Starvin’ Marvin the turkey’s mouth. Don’t be afraid to be silly—I love to make Marvin dance and often make sound effects to go along with the song (stomach rumbling, gobbling and sometimes he even says, “FEEEEEEED ME!”). You can even have clients volunteer to make Marvin move and talk–but be prepared for LOTS of giggles! This activity could also be a simple craft to make at home to keep your kids occupied and having fun on a rainy November day. Pre-cut the box, have them design and draw the turkey on it and then, voila! You have a new game to add to your collection. 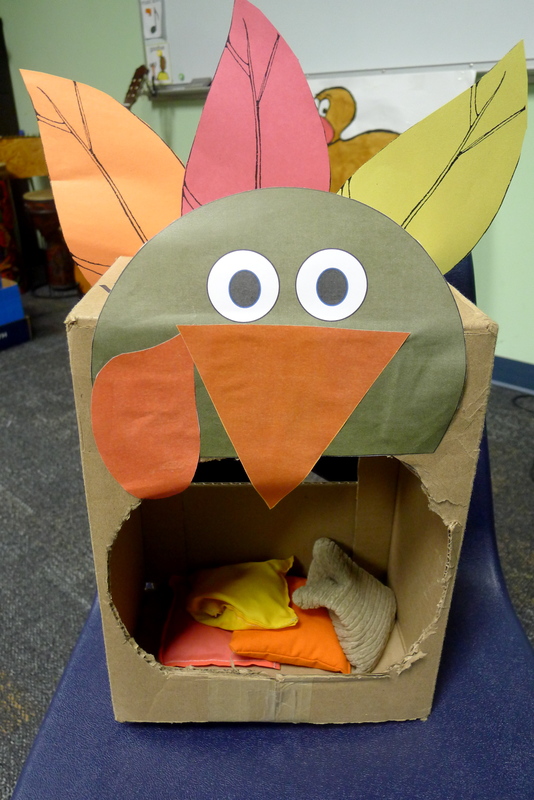 All you’ll need to make your turkey is a small cardboard box, scissors and my turkey face template (included below). I cut a large hole in the front of the box and glued the turkey face together on the top. I also had some left over feathers from another activity, so I glued those on the back of the box to give him a cute tail. Let your creativity run wild with this one! During the song, encourage your clients to wait until the count of three to toss their bean bags into Marvin’s mouth. Depending on client needs, I either hold the turkey close to the client so they can easily put their bean bag inside his mouth or set it up further away if they are able to toss the bean bag. Repeat the bean bag toss as many times as desired and be sure to encourage lots of gobbling and wing flapping from clients who are waiting for their turn! Once each client has had a chance to “feed” Marvin, have everyone speak for him and say “Thank you” by using their voices, sign language or AACs—whatever works best for each client. Below is a recording of “Starvin’ Marvin” and a free PDF of my turkey face template. I hope you have a blast making your own turkey and implementing this activity with your clients and children! This week, I want to share a Thanksgiving song called “Our Cornucopia” that I wrote to encourage my students to generate some positive feelings about themselves and their classmates! I decided to use a cornucopia as the basis of this activity because it’s a familiar holiday icon that many of my students might see in their homes, school or the community. The image of a cornucopia full of objects (people, instruments, Thanksgiving food) is also a great way to help concrete thinkers visualize and understand abstract holiday themes like gathering together and being thankful. Have students draw names out of an overturned drum when it is their turn during the song—my students love the suspense of unfolding the paper to see whose name it is! Students come and tape the name they selected inside the cornucopia. I simply repeat the name verse (see recording below) until each student has had a turn. Compile some images of instruments that you frequently use in your sessions. Real photographs of the instruments work really well for this! 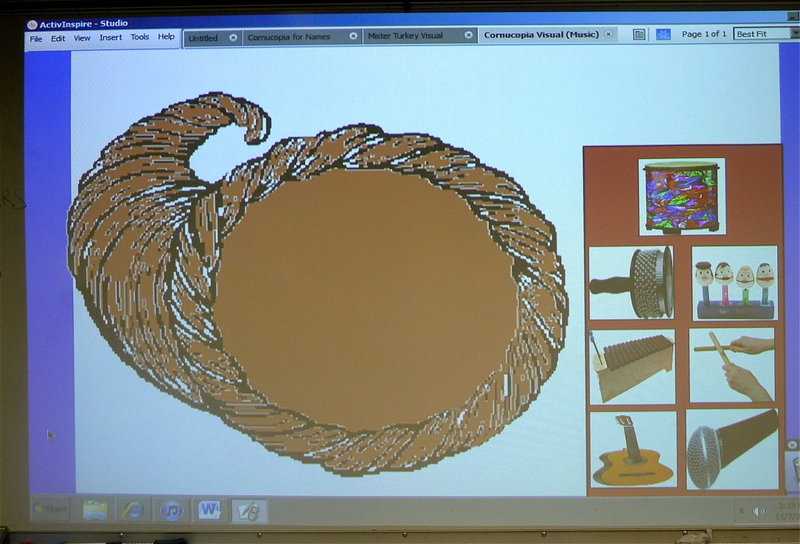 Project these images on a SMART board with your cornucopia OR create your own visual aid to distribute. Give each student the opportunity to select an instrument to add to the cornucopia. If possible, ask them to share what they like about that instrument! This can also be a great way to find out what instruments and activities your students prefer. Self-esteem and complimenting peers: Have clients choose a name out of a basket and encourage them to write one positive thing about the person they selected. Put these comments back inside the basket so that the facilitator can read the anonymous compliments out loud to the group. Self-expression: Have clients write a line or verse about someone or something they are thankful for. This could be as simple as a fill in the blank lyric or working together as a group to write a whole song. 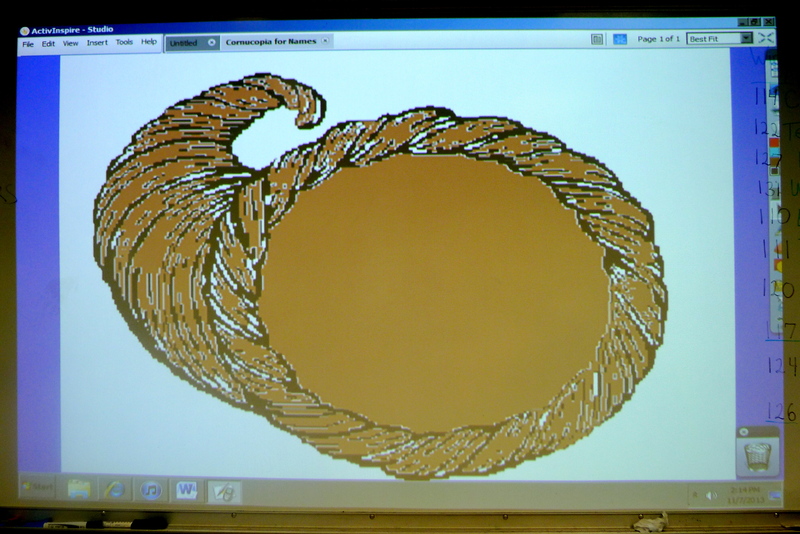 Art and Music: Draw a large cornucopia on poster board. Have clients draw a picture of someone or something they are thankful for and have them add it to the cornucopia. 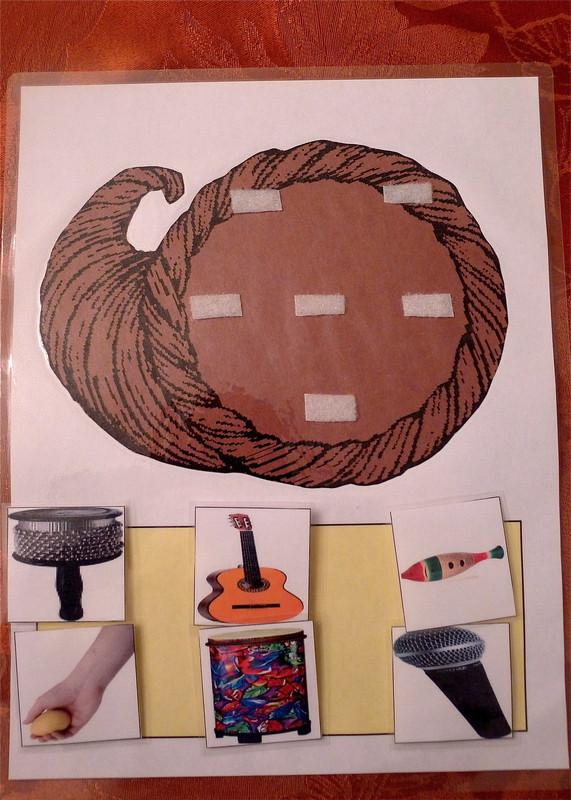 Activity Choice Board: Facilitate the cornucopia song using images that represent different songs and activities that are familiar to your clients. When they have selected their favorites to put inside the cornucopia, have them work together to choose one of those selected activities to do next in the session! Below is a recording of “Our Cornucopia.” I included a tag at the end that I use for younger children, which can easily added or omitted as needed. How will you adapt this activity for your clients? I’d love to hear about it!